The Canadian Auto Workers union said Sunday it had reached a tentative agreement with General Motors Corp. on a multiyear pay freeze and other concessions needed to qualify the company for government aid. The deal freezes wages and pensions through September 2012 and for the first time requires workers and retirees to pay health care premiums. Cost-of-living adjustments also are frozen until June 2012. The deal would extend a previous contract with GM by one year. The two sides met through the night and reached agreement about 5:30 a.m. EDT. "Our members have been through so much stress the past four or five months," Canadian Auto Workers President Ken Lewenza said at a Sunday afternoon news conference in Toronto. "I think removing this cloud over their heads is going to be a huge relief for our members." The union had said Thursday it was willing to help GM's Canadian unit cut costs in its bid to qualify for Canadian government loans. In a statement, GM said the deal "will bring the company's labor costs to much more competitive levels and help ensure the company's long term viability." "We compliment the CAW for their leadership to share sacrifices in these extremely challenging economic times," GM said. The 10,000 workers covered by the contract will hold ratification votes Tuesday and Wednesday, the union said. The union said it plans to continue its practice of pattern bargaining with the three North American automakers and said talks will begin this week with the Canadian units of either Ford Motor Co. or Chrysler LLC. GM Canada is eligible for loans of up to 3 billion Canadian dollars - or $2.3 billion in U.S. dollars - under a government aid package. It submitted a restructuring plan last month. Last week, Lewenza said the Canadian union had reviewed the United Auto Workers' tentative concessions agreement with GM in the U.S. and would negotiate its terms based on that agreement. Lewenza said a key goal would be that Canada maintain its market share and that Sunday's deal should help do that. The concessions are contingent on Canadian government aid to GM and to maintaining "a proportional Canadian manufacturing presence," the union said in a statement. "The sacrifices we've made in this agreement are extensive, and our active and laid-off members as well as retirees will still face incredible uncertainty in the months ahead because of the industry's unprecedented crisis," said Chris Buckley, the union's bargaining chairman at GM's Oshawa plant. He said its now up to Canada's government "to use its power to keep the industry alive, and to protect Canada's proportional share of it." GM Canada's viability plan hinges on what happens with its parent company, which sparked long-held fears last week after GM filed an annual report with the U.S. Securities and Exchange Commission revealing that auditors have raised substantial doubt about its ability to continue operations. GM has already received $13.4 billion in U.S. government loans and is seeking a total of $30 billion from the government. Its restructuring plan also includes laying off 47,000 workers worldwide by the end of the year, which include about 4,000 that will be cut in Canada. 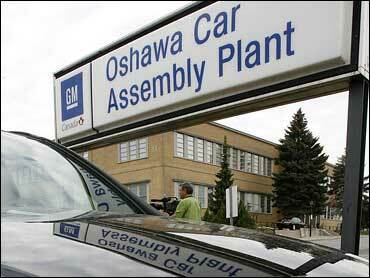 GM will also close five more U.S. factories.